Knaresborough Town moved nine points clear at the top of the NCEL Division One table courtesy of a 2-0 win over Dronfield Town. An early Ben Parkes strike and Gregg Anderson’s late header sealed a 13th win in 15 league outings as Paul Stansfield’s side extended their unbeaten league run at Manse Lane, on Saturday. Dronfield’s Joe Butler saw an effort blocked close to the Knaresborough goal in the opening stages before a Colin Heath free-kick was well saved by visiting gloveman Aurelio Masson. 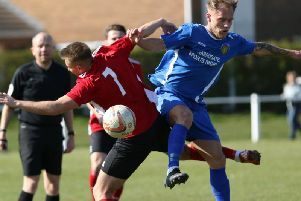 The Boro breakthrough arrived in the 18th minute when Steve Bromley played in Ben Parkes on the edge of the penalty area and the midfielder steadied himself before slamming a low shot in off the left upright for his first goal of the season. Christian Savage headed a free-kick wide for Dronfield before Will Lenehan went close with two headers at the other end, the second being tipped over by Masson following Harry Brown’s corner. Greg Kidd then crossed for Bromley who saw a strike saved and cleared off the underside of the crossbar, and Brad Walker then had two efforts saved. Dan Atkinson kept out a shot from Danny Wood as Dronfield attempted to hit back, but Boro came again and Heath fired narrowly wide to end the half. After the break, a long-range Brown strike was saved comfortably and Kidd headed wide before a string of cautions threatened to unsettle the game as tempers became fraught. Heath got himself in a tangle as he attempted to steer a Ben Cohen cross into the goal, and Walker was also denied by a close-range save after his run had offered a chance to Cohen and then Parkes had a shot saved. Boro’s second goal, which finally settled the nerves, did not arrive until the first minute of added-time when centre-half Anderson rose well to power home a header from Tom Hesketh’s corner from the right.